Lavender essential oil, warmed with a splash of vanilla. Classic, simple, and timeless. Made in small batches, each soy wax tea light is hand poured into a recyclable tea light cup and scented with both essential oils and fragrance oils without phthalates. 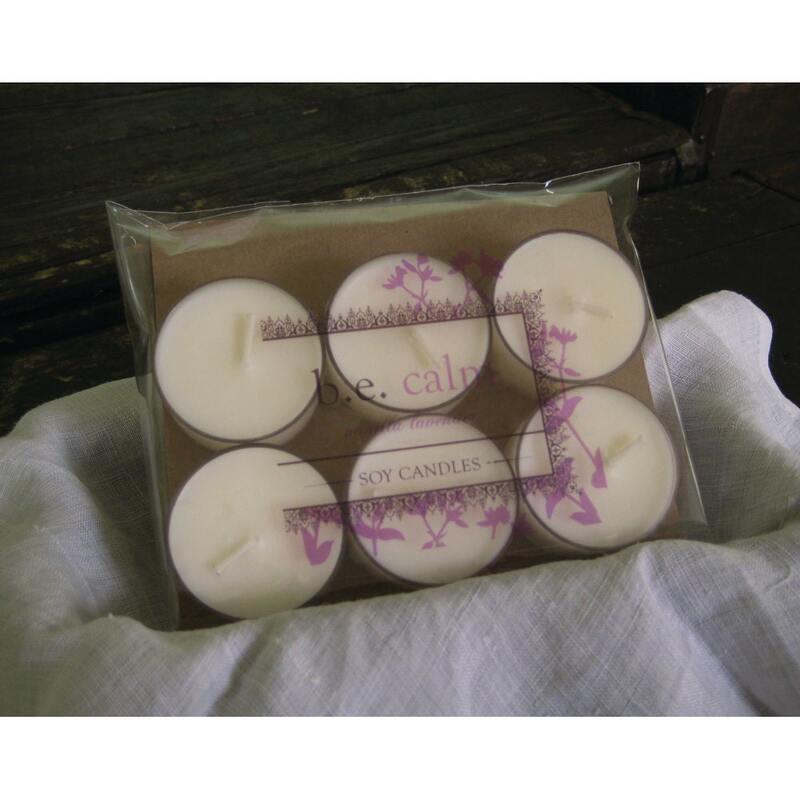 Each set contains 6 tea lights attractively packaged in a minimalist cello bag with our simple label. Each tea light has a burn time of approximately 5 hours, for a total of 30 hours per package. *Keep the wick trimmed to ¼“ & burn away from drafts to prevent flickering and soot. *Be sure your candle is used on a heat proof surface and out of the reach of children, pets, and away from anything that could catch fire. *When finished burning your tea lights, wash the cups out in warm soapy water and recycle! love love love this !! Smells awesome !! love it !!! Fast shipping ! Smells wonderful !! I accept Paypal, CC through Paypal, and personal check. If you'd like to pay by check, please make a note during checkout, and I will send you our mailing address. Sorry, but products will not ship out until payment has cleared our bank. Cancellations: Should you decide to cancel a sale, please send a convo immediately. Thanks! Return Policy: I want you to be thrilled with your purchase! I offer a 15-day money back guarantee (minus shipping charges) for all items purchased from Bazil Essentials. Simply e-mail me for instructions on returning the product. Please purchase proof of return delivery. For items that have been damaged or broken during shipping, please keep the damaged item(s) & contact me. Because of FedEx's & USPS's insurance policy, I unfortunately cannot replace the item if it has not been kept. In some cases, a picture is sufficient. Please convo regarding any damages asap. SHIPPING: Your purchase will ship within 3-5 business days, although during the hot summer months, I only ship Monday - Wednesday to ensure your order reaches you in pristine condition. Please convo with any questions regarding your order. Rest assured, I am always working hard to get your order shipped out as soon as possible. To keep shipping costs low, I ship USPS Parcel Post for all single small item orders. Large item and multiple item orders are often shipped via FedEx or USPS Priority. If you prefer a different method of shipping, please send a convo for a custom listing. **International customers.... please send me a convo with your address and items you wish to purchase so that I may create a custom listing for just for you. Thank you! Are you a retailer that is interested in carrying my line of high quality boutique candles & perfumes? I'd love to e-mail you over a wholesale package! Simply convo me through Etsy. Please include your e-mail address, and I'll get that over to you asap. I welcome custom orders too. I can help you create the perfect favors for showers & parties, complete with a semi-custom label just for your event! Convo for inquires.